It's funny how sometimes we will wait for something we ordered to come in. That something we ordered is supposed to save us time. 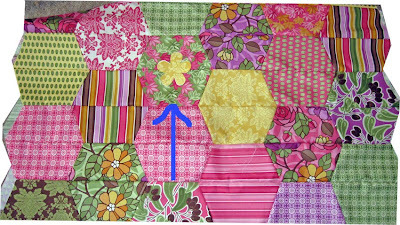 For exampled, I ordered a flower die cut to add flowers to my Santorini quilt. I just didn't want to cut out all that flowers and fusible web. I waited patiently for it to arrive. When it recently did, I cut out a sample flower and added it to the quilt. Results for all that waiting to save time: I think it gets lost in the hexagon blocks It's a little too small I think. I had planned on cutting out solid color flowers to match the solid blocks. They are lavender, green, yellow and pink. If I don't add them to the center of the blocks, maybe I can place them in corners where three hexagons meet. Decisions, decisions usually make for new UFOs for me.